If you run a small business, are a creative entrepreneur, an author, or an independent freelancer, it is inevitable that you will need some sort of publicity to be successful. Most will have some type of small publicity, but why not think bigger? You probably are thinking “big-time publicity is only for big-time companies“. The everyday life of a journalist involves searching diligently for good, new stories and they will pick up a good story from a small company just as readily as from an established firm. I teach authors in my book writing class this simple principle. But knowing this is key to get any sort of media attention as an entrepreneur. But how do you go about finding journalists who are interested in writing about your product or service, and giving your brand the attention it deserves? To get started, you can search for members of the media who write about your niche and reach out to them to try and develop a relationship. This is the most popular method for getting publicity, but it is also the most time-consuming. If you want to reduce your time, you can hire a PR firm. The firm will do the work, but while this approach is less time-consuming, it’s can be VERY expensive and there is no guarantee that they will be able to get the job done. A more affordable alternative that doesn’t take much of your time is to create a press release campaign. The approach boils down to sharing press releases on a frequent basis, using different methods and angles. The goal is to send one out every few weeks. And guess what? Contrary to popular belief, press releases used the right way, can be a great publicity equalizer. A small company or freelancer have the same, or even better, chance of being noticed by a journalist just like a big company can. Poor distribution – Most press releases from small companies are sent by free or low cost services that simply publish the release on a website. That’s it. The release is NEVER seen by any actual journalists, editors, or other media members. Poor writing – Most press releases are boring. This is because the writer doesn’t put themselves into the mindset of the journalists they should be writing for. Distribution: To get your press release directly into the hands of journalists and editors, you must employ a true newswire. Someone who has established relationships, and gets your press release in front of actual journalists. PR Newswire still is the most popular source for journalists looking for stories. Writing: To have a great, news-worthy press release, you need to avoid poorly written headline, bad grammar/spelling, and an unimaginative angle. Nobody cares about your company. Think like the consumer when writing your press release. For my most recent book releases in the bestelling Freedom Project book series, I’ve worked with eReleases. They use the traditional newswire service from PR Newswire. This means my release was sent directly to journalists who were interested the topics covered in my books. 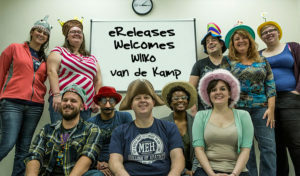 The eReleases staff and editors critiqued my press release before sending it out, and they gave me ideas for headlines, hooks and angles to be more appealing to the media. This is key in making a press release newsworthy. Are you ready to get started crafting your own PR campaign? Get serious about publicity – Living by Experience readers can take advantage of eReleases’ New Customer Special and save $130 today!